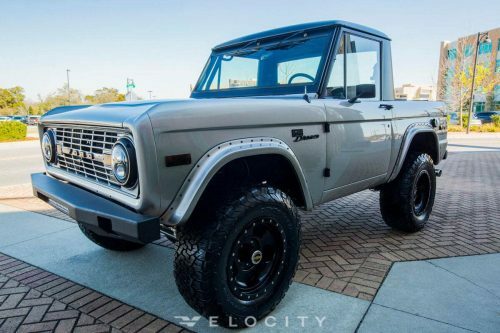 We’ve put top-quality care and equipment into this classic Ford Bronco. What greets you first is the absolutely stunning Custom PPG Paint in a classic Brittany Blue on a meticulously refinished body. The chassis underneath is powder-coated black, as is the custom hand-built 6-point roll bar with integrated LED lighting. Who wouldn’t love the Ford Racing 5.0-liter Coyote V8 nestled under the hood, mated to a 4R70 4-speed transmission? You’ll stop on a dime with Wilwood 4-wheel disc brakes and Hydroboost. As for the interior, we’ve installed Dakota Digital Gauges into a custom dash along with a Bluetooth stereo system and Vintage Air heating and A/C. And there’s no looking past the custom hand-stitched brown door panels, dash pad, and seats.